Length: 12 1/2" R/S: 14 1/4"
Painstakingly detailed and fully assembled, this model includes a stand for desktop or shelf display. This high quality replica is handcrafted from mahogany and comes with a wooden display base. 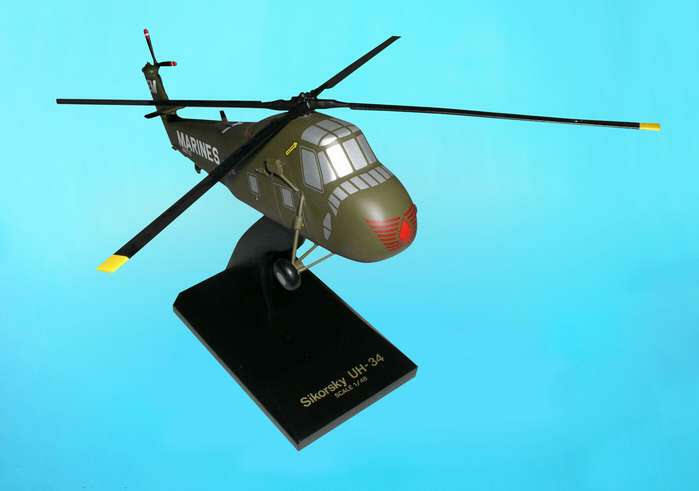 The Sikorsky HUS (UH-34) Sea Horse served valiantly in Vietnam with at least eight crew members earning the Navy Cross. It could cruise at only 94 mph but carry almost its own weight in cargo. A Marine HUS pulled Alan Shepherd Jr. from the seas in May 1961 when his space capsule landed in the ocean after completing America's first manned sub-orbital space flight. Sikorsky HUS/UH-34D "Sea Horse"
1957-76. This was the mainstay of Marine Medium squadrons for a decade. The Reserves kept it in service until the mid 1970s.